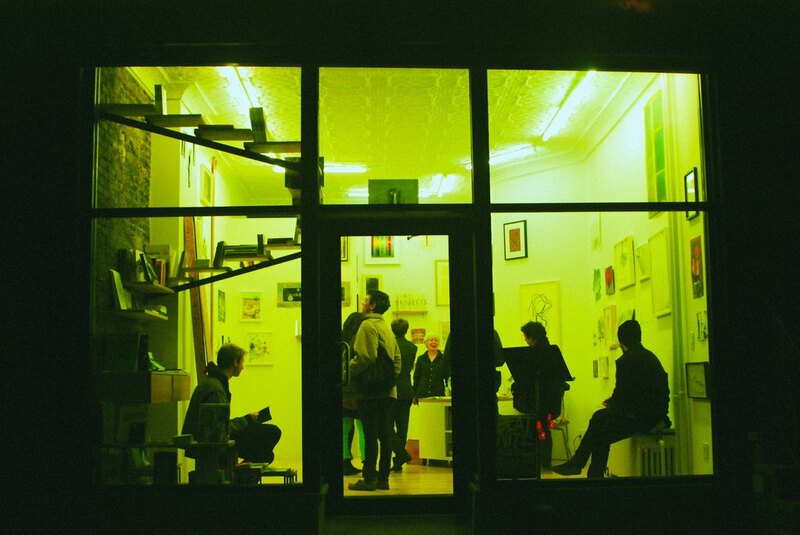 Just Beat It: How was the great gallery nite in Bushwick? Bushwick's beloved Beat Nite returned to the neighborhood last Friday night in its eighth iteration, supplying an eclectic mix of art ranging from grafitti-inspired art, abstract painting, to full-blown installation and performance. 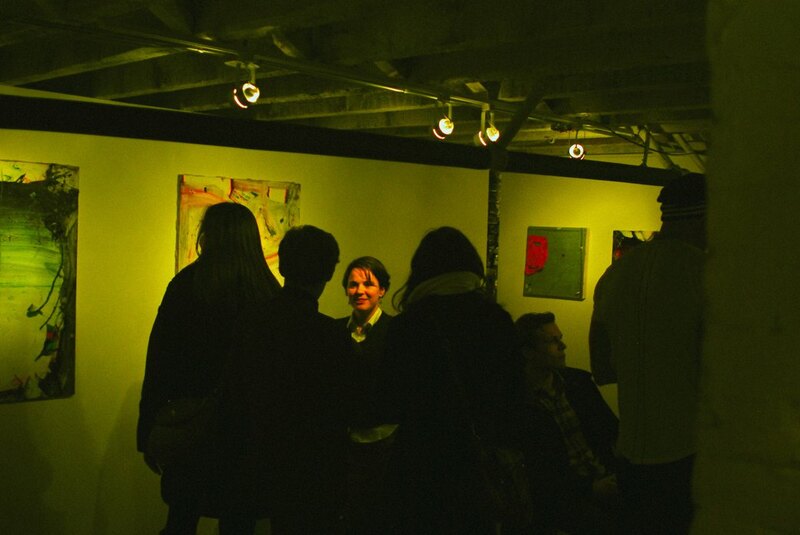 Entitled The Limited Edition, this "nite" boasted an artfully and well-curated selection of ten participating galleries between the Jefferson, Dekalb, and Myrtle Avenue stops. According to Beat Nite curator and Outlet Fine Art co-founder Julian Jimarez-Howard, his goal this time around was to be more selective in choosing the participants in order to make the gallery crawl a manageable size for attendees, and to highlight certain newer galleries on the tour in order to build excitement and momentum into these new spaces. While Jimarez-Howard chose participating galleries that were close enough together to encourage gallery-goers to make it to all ten locations, some people were expressing gallery fatigue midway through the night and only made it to three or four of the spaces. However, the feedback from attendees was overwhelmingly positive, especially from those that were not familiar with some of the galleries before the event. At almost every venue I overheard excited Bushwickians viewing the crawl guide over absinthe-laced cocktails (Beat Nite's signature drink), debating which way to go and which galleries they were most excited to visit. For those who missed out on the crawl, here is an overview of some of the nite's highlights. 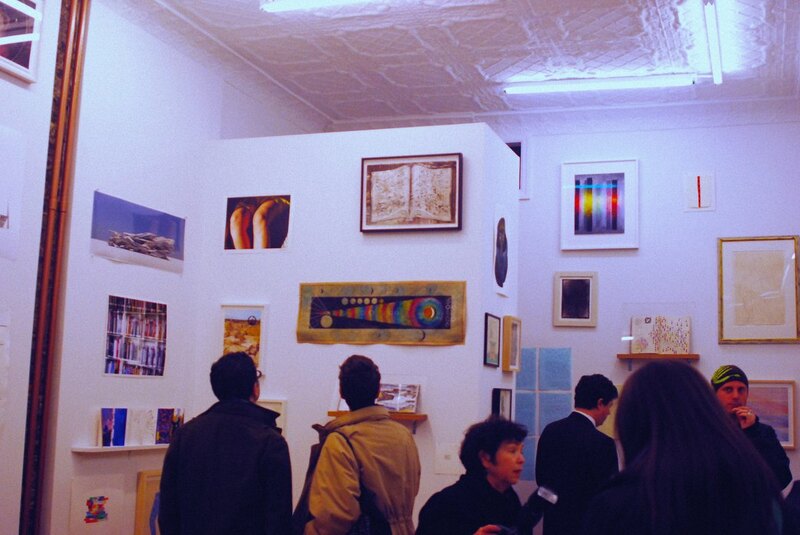 Auxiliary Projects kicked off their third exhibition, From the Desk of Adam Thompson, on view until March 24th. Thompson's understated mechanical pencil drawings capture the simple and banal in an isolated and snapshot-like format. Thompson explained to me that he finds inspiration in everyday moments and objects, such as postcards, vintage books and even computer icons. 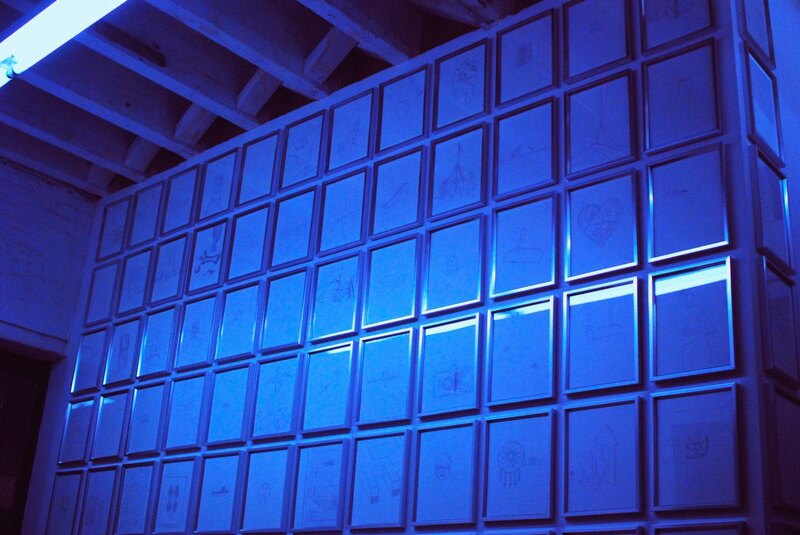 Dozens of the artist's intimate drawings were installed in a salon style hang on one wall of the gallery, while others remained neatly stacked in a pile, seemingly waiting to be installed. In the other corner, a flatscreen TV sat haphazardly on the floor, repeatedly playing Hallway, one of Thompson's recent kinetic video collages. The exhibition generated an immediate understanding of the obsessive nature of the artist's creation; as if he is trying to quantify the pluralism and oversaturation of images in popular culture and our everyday lives. Tip: make sure to peek inside the file cabinet, which stores even more of Thompson's drawings. Schema Projects featured Drafted, a selection of works on paper from an impressive list of both American and International artists, which is on view until February 24th. The show boasts a plethora of artists and works installed from floor to ceiling, including personal sketch books, intricate collage, detailed views of Parisian rooftops, colorful watercolor and many other works that exemplify the versatility of their medium. The gallery is also the home to Blonde Art Books, which showcases a selection of exhibition-specific books and printed material under the direction of Sonel Breslav. 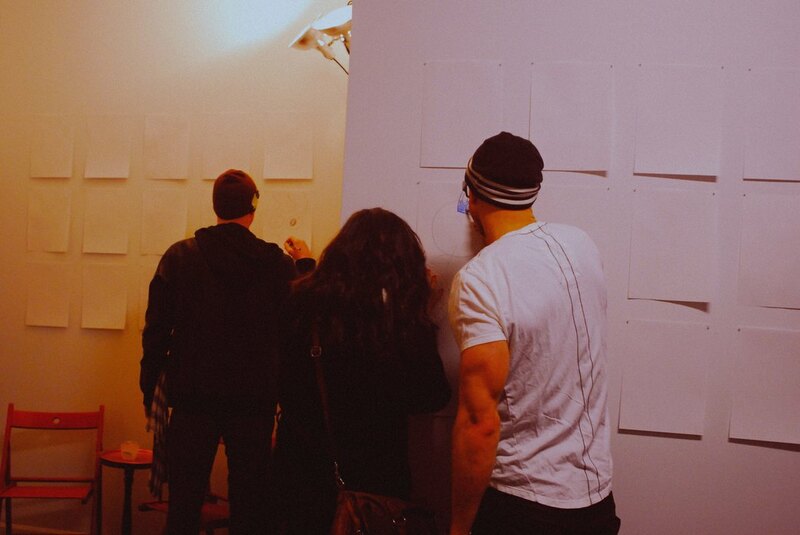 Sardine offered something completely different: walls completely covered with blank sheets of paper ready to be decorated for the gallery's By Hand: A Night of Drawing co-hosted by the gallery and Pioneers of Inspiration. The gallery was busy preparing for their upcoming show to open March 9th, so this Drink and Draw event gave crawlers a chance to flex their own artistic skills and participate in a collaborative installation while, of course, sipping on a cocktail! A short crawl around the corner, Beat Nite continued to Weldon Arts featuring Crumbling Cities, the first New York exhibition of street artist Nether, which closed this past Saturday. Nether hails from Baltimore and aspires to use socially informed street art projects to provoke public forum and discussion. 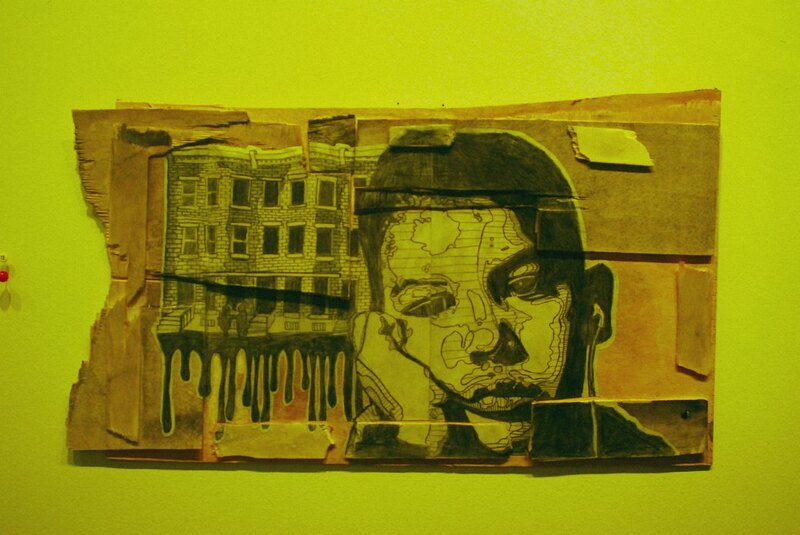 His large-format drawings depicting images of smiling children and Baltimore cityscapes are wheat pasted to blank walls on abandoned buildings, or in this case, onto wood board in the gallery space. Nether incorporates found objects, such as ribbons, housing advertisements, wood scraps and other detritus, that give depth to his two-dimensional depictions. They create a sense of place and have the effect of transforming the gallery into a street scene itself. Low Brow Artique, the street art boutique turned gallery, offered another display of graffiti-inspired works from a group of artists who have been working together as a crew for twenty years. Entitled The 4MULA: TD4-NYC-2013, the exhibition showcased the work of seven artists: Zeso, Bisc, Zimad, Meres, Bishop203, Leia, and Just1. The disparate works are presented on one side of the boutique, just as blocks of mural one might encounter on an actual street in Brooklyn or Queens. 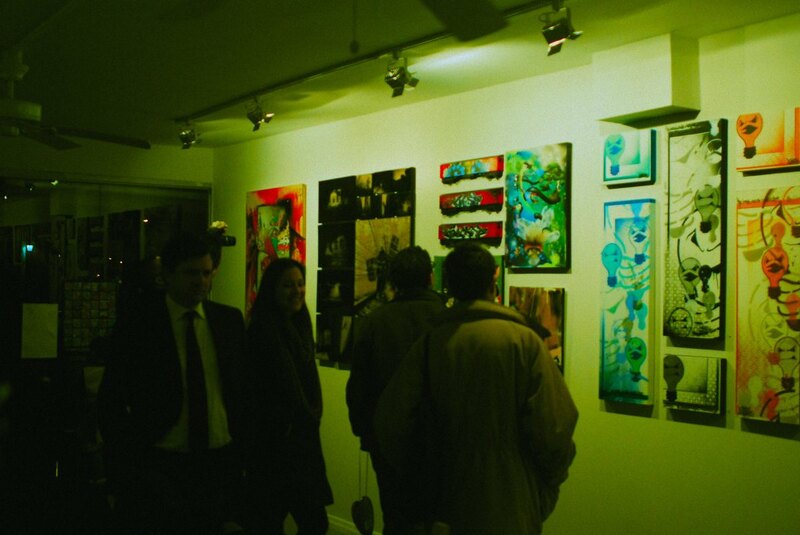 The exhibition showcased the maturation of these artists as they have each developed a unique style and adapted their techniques to fit a canvas. Low Brow Artique and the artists are all closely connected to Five Pointz in Long Island City, where you can view other examples of the artists' work in situ. Simply entitled Show #5, The Parlour's current exhibition features works by Kenny Rivero, Shino Soma, and Johannes DeYoung. As the name would suggest, we were greeted at the entrance by Rachel Phillips and Charles Tisa, whose French salon-inspired space is open to artistic collaborations, performances, and discussion. While all three artists deal with expressions of identity and self, culture tradition and contemporary practices, Rivero's Cloud Thieves dominated the parlor with its scenic and dreamlike landscape. Microscope Gallery presented Robots: Paintings by Amos Poe, which will be on view until March 18. 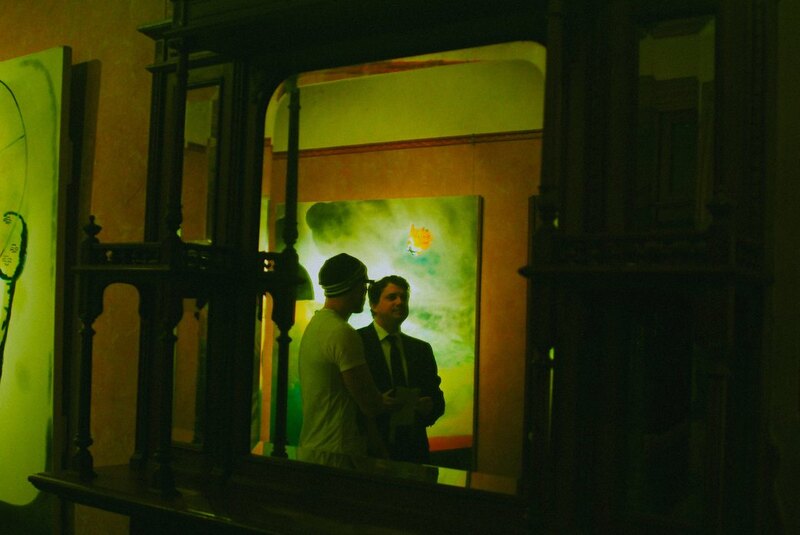 Poe, who is better known as a filmmaker, writer and producer, makes his foray into painting with this debut. 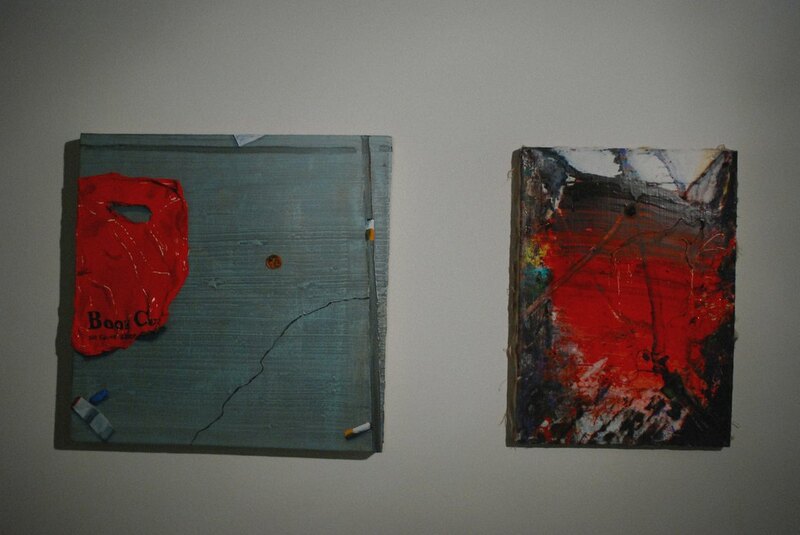 The works, all en grasaille, are fantastic abstract canvases reminiscent of stop-motion cinema. 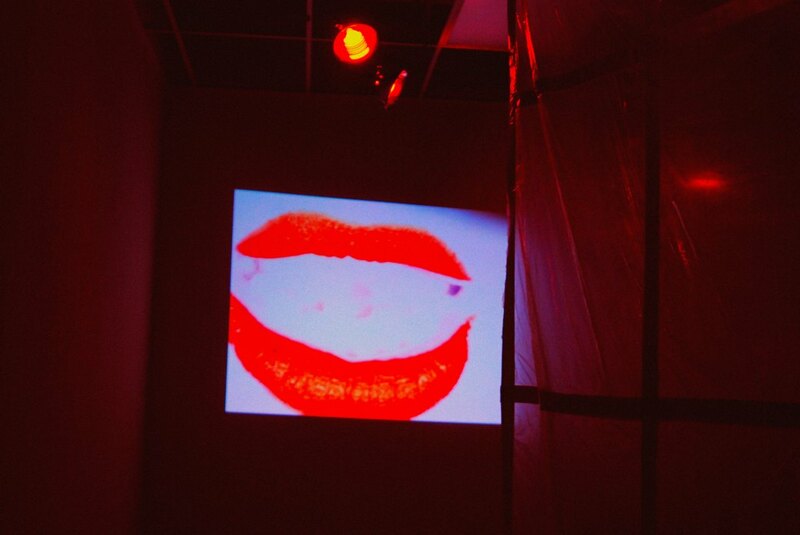 They possess a nostalgia that conjures images and recollections of early cinematic stalwarts like The Cabinet of Dr. Caligari, Metropolis, and German Dada artists like Kurt Schwitters. 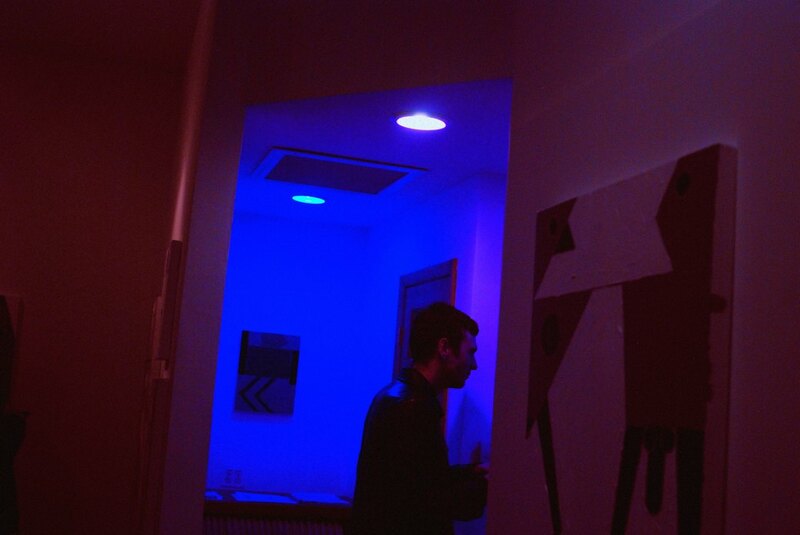 Airplane Gallery presented Strange Lens: Three Painters exhibition. Hilary Doyle, Dan Herr, and Mike Olin's pieces perfectly contrast and complement to show a diversity in today's painting. Playing with concepts of figure versus ground, abstraction versus representation, and painted versus real objects, the three artists come together harmoniously and represent a deep understanding of historical art movements such as art brut, bad painting, and abstract expressionism, while still reinventing the medium. The bunker-like quality of the space adds to the underground and avant-garde feel to the entire experience - just make sure not to hit your head when entering the gallery. The night's successes were visible from the volume of gallery-goers and the general interest everyone paid to the various shows. While some might have been more familiar with the spaces than others, it was clear that there was something new and exciting for everyone who made the trek. The galleries involved in this edition of Beat Nite created an interesting melange of artistic inspirations, mediums and styles. Cohesiveness in its variation, along with surprises around every corner, contributed to a dynamic and thought-provoking evening for all involved, leaving us in anticipation for the next edition!